I've been climbing in the Wasington State Cascade mountains since 1992. My main joy is long, remote wilderness trips and long, moderate (mid 5th class, that is) rock routes. I've made a few excursions to other mountain ranges. I've written a few stories about my climbs. I'm also good with navigation and routes and have written up route descriptions of most climbs that I've done. Robbers Roost: A nine-day hike through remote canyons in Utah, March 1997. Sierra climbing and traverse: Alpine climbing in the Palisades and a backcountry traverse of the Yosemite high country, September 1998. Escalante: Another nine-day hike through remote canyons in Utah, March 1998. Glaier Peak Traverse: A traverse of Glacier Peak and the Dakobad Range with photos, August 1999. Clark Mountain Extravaganza: A four-day trip including a climb of Clark Mountain and a visit to the Napequa Valley, July 2000. 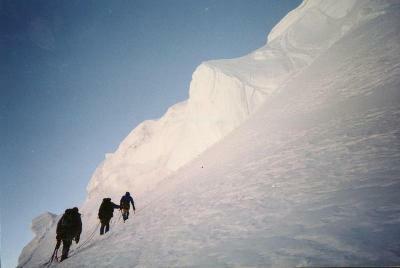 Sequoia and Kings Canyon traverse: A long alpine traverse along the High Divide, September 2000. Mono Recess, Sierras: Eight days exploring the valleys and ridges around the Mono Recess, October 2001. Evolution Region: Eight days in the Evolution region of Kings Canyon National Park, October 2002 (gallery). Northern Yosemite, Sierras: Eight days rambling the sub-alpine region along the northern border of Yosemite Park, October 2004. Fall 2006: A September trip in the Beartooth mountains and an October trip in the Sierra, 2006. Emigrant Wilderness: 7 days rambling in the sub-alpine region of the Emigrant Wilderness, September 2008. Route descriptions for climbs that I've done, mainly in the northwest. Good if you are looking for reference for a climb that you are planning to do. Trip reports and stories: climbing and sailing. Longer, all text. Stan Wagon has some route descriptions. South West America has some slot canyon lists. There are many pictures of climbing trips in my photo galleries.